Set up message content, keyword and access number for StaffSafe. Company StaffSafe preferences can only be changed by Customer or Platform Administrators. Click the 'StaffSafe Preference' link in StaffSafe tab drop-down menu (also accessible via 'Setup' menu on left-hand side). View or edit company StaffSafe settings here. 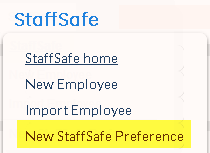 Change the company StaffSafe preferences. If there are no existing stored settings (i.e. this is the first time preferences have been set up), update fields directly. •Schedule Once with Shift End Reminder - this is a shift end reminder option. (User must text in with a shift length to check in if this is selected). This field is used for the "Schedule Once with Shift End Reminder" option. Set the time the employee should receive their shift end/checkout reminder. You may schedule the reminder to be sent up to an hour before or after the shift end time in ten minute increments. (-60 minutes to +60 minutes). Designated mobiles to receive StaffSafe notifications, employee responses and escalation alerts. Designated email addresses to receive StaffSafe notifications, employee responses and escalation alerts. First message sent to check the employee’s status. The message sent to designated escalation mobiles and emails when a staff member has not responded to the first two 'Check' messages. The message sent to designated escalation mobiles and emails when a staff member responds during the escalation period, clearing the escalation. The message sent to the designated escalation mobiles and emails when a staff member uses the trigger keywords to escalate their status. When using the "Schedule Once with Shift End Reminder" option, this is the message that will be sent to remind staff to check out at the end of their shift at the time selected in the "Time to Send Reminder Message" field. When using the "Schedule Once with Shift End Reminder" option, this is the message that will be sent to advise staff that they have successfully checked in to their shift. When using the "Schedule Once with Shift End Reminder" option, this is the message that will be sent to advise staff that they have successfully checked out of their shift. This is the message that will be sent to advise staff that they have been checked out of their shift by an admin user. When using the "Schedule Once with Shift End Reminder" option, this is the message that will be sent to advise staff that an invalid check in or check out message has been received so their request has not been processed. *FOR ALL OTHER OPTIONS* this message is automatically generated by the system and the content cannot be set. The keyword staff can SMS at any time to request help and trigger escalation. For more advanced users, the 'Keyword to Trigger Escalation' can be a regular expression. The number that the 'Check' message is sent from and receives replies to. •Whitelist - Check messages are only sent to employees on both the recipient list and Whitelist. 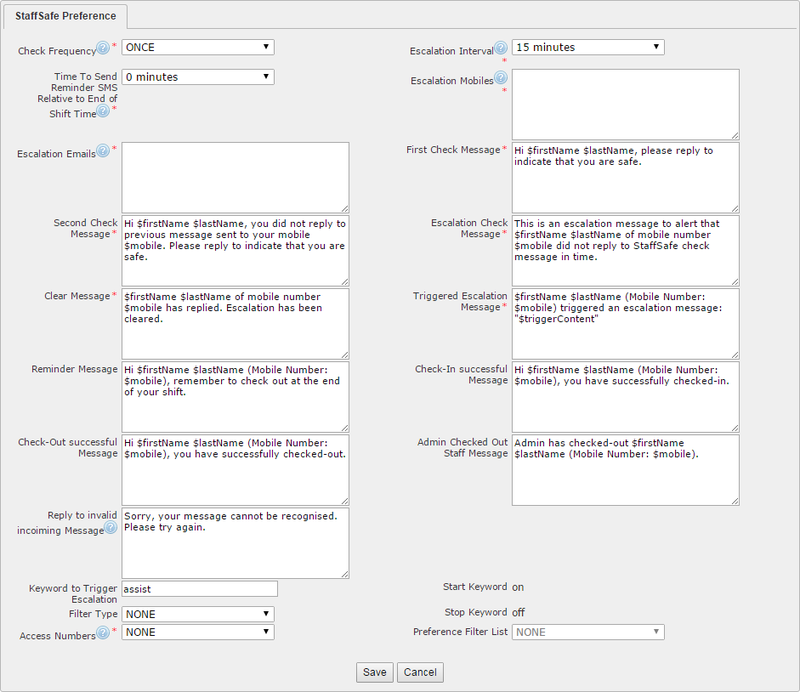 •Blacklist - Check messages are not sent to any employees listed on the Blacklist. The list that will be used for the defined filter (if applicable). Undo any changes and exit.